Saving a nation, one city at a time. My name is Troy Willis. I was doing this CrossFit thing with what I had, and when people asked me about it, I said, "I guess you could call it Cowboy CrossFit." I would like to thank Chris Dunkin of CrossFit GP for the encouragement, coaching, support and friendship that got me involved in CrossFit. In the 13 months that I have been involved in CrossFit I lost a dear friend of mine, Jody Brooks(March 13, 1974 - Oct 11, 2008). Jody was a stand for kids to be physically active and a part of a community. As a tribute to Jody I decided to build a program and a national initiative getting kids involved in CrossFit. I have now joined efforts with Steve Liberati of Steve's Club in Camden NJ to make this goal a reality. 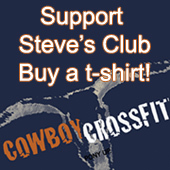 Cowboy CrossFit is a proud "Steve's Club Participant" offering CrossFit workouts to at risk youth. Next summer we will have a games event here on the ranch that sponsors the achievements from the kids across the nation. If you would like to be involved please email me for more information.